This review is of the cut shown at the BFI London Film Festival in October 2018 – the UK release date is currently listed for November 16th 2018. Dario Argento’s 1977 film Suspiria is a favourite amongst horror fans for its creepy atmosphere and stunningly colourful cinematography, something that nobody could perfectly replicate even if they tried. In that regard, it makes sense that Luca Guadagnino, in making his own version of Suspiria, hasn’t even bothered to replicate the style that Argento brought to the original, because as visceral a director as Guadagnino is, even he can’t come close to making something quite as visually grabbing as the horror master himself. 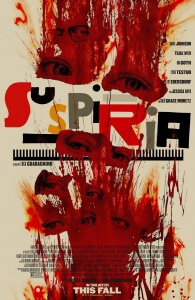 There’s a lot that Guadagnino has nixed from the original in making what is essentially a remixed version of Argento’s film; in fact, so much of the plot, characters, and scares have drastically changed that some will be quick to condone it for barely having anything to do with the original Suspiria at all, but others will marvel at the sheer balls on this guy to take a beloved genre classic and just do whatever the hell he wants with it. Either way, you can at the very least say that this is one horror remake that is most certainly not a carbon-copy of the original, as well as the fact that this is a movie that is seriously going to divide audiences when it comes out (I would be shocked if this does not receive an F on Cinemascore like mother! did last year). As for me, I found this a rather difficult movie to round up opinions about, because while nobody can fault the unique creepy style that Guadagnino brings to the film, it is a flawed movie that I’m still uncertain about in many areas. Some will love it, others will hate it; I find that I’m somewhere in the middle here. Set in 1977 Berlin, an American dancer by the name of Susie Bannion (Dakota Johnson) arrives to audition at the prestigious Markos Dance Academy, under the tutelage of Madame Blanc (Tilda Swinton) who soon selects her as the lead in her upcoming production. However, a series of odd events, from the mysterious disappearance of sceptical student Patricia Hingle (Chloë Grace Moretz) to multiple disturbing dreams that Susie keeps having, reveal that the academy is being run by a coven of witches, who have their own sinister ideas for Susie as she continues to thrive. I am extremely curious to see how this movie plays with people who know and love the original, because both versions are so radically different from one another that I can easily see some getting extremely angry with this film for barely even feeling like a remake. However, much like how both John Carpenter’s The Thing and David Cronenberg’s The Fly were similarly far removed from their own original films, Guadagnino’s version of Suspiria stands on its own as a piece of work that will most certainly be analysed over the years by critics and audiences alike. The director brings a more grounded visual look to the story; gone are the brightly lit colours that blanketed Argento’s version and in its place is a rather cloudy and dimly-lit atmosphere where rain or snow could fall at any given moment. While it certainly sets itself apart on a visual level, the style change does make it significantly blander to look at and the angles from which Guadagnino and cinematographer Sayombhu Mukdeeprom choose to shoot it aren’t as visceral or even as daring as Argento managed to accomplish over forty years ago. Nevertheless, there is merit to how the director slowly builds up suspense and dread, over a running time of two-and-a-half hours which does tend to seriously drag but is spent crawling reasonably effectively towards some truly horrific sights in the second half of the film. He has some great actresses in his ensemble to help carry the movie on their own terms, including Tilda Swinton in a dual role as dancing teacher Madame Blanc and also under heavy prosthetics and make-up as male, elderly psychiatrist Dr. Jozef Klemperer (credited as being played by “Lutz Ebersdorf” who has recently been confirmed to actually be a pseudonym for Swinton), so the movie is well-acted and certainly well-made on Guadagnino’s part. However, the movie does suffer from a bloated running time where scenes do go on for far longer than they probably should, with whole sub-plots and characters – including that of Klemperer’s missing wife, played by original Suspiria star Jessica Harper in a small role – that could have easily been erased from the film altogether, and a third act that features twists and turns that don’t really add up or make a whole lot of sense when you really pull them apart and analyse them. I suppose the intention was to create an experience for the audience rather than a fully-functioning narrative, but I’m not sure if most audiences will accept something that’s truly unconventional like this; quite a few people at the screening I attended walked out about halfway through, and even the applause at the end from those who remained was fairly muted, so I’m not entirely sure this is an experiment that is going to entirely pay off. There are things I do like about it, but there are other things I am iffier about; either way, I’m glad I was able to see it and voice an opinion that’s probably a bit more half-and-half that most other people will be about it. Some will either love it, or hate it; a true Marmite film if ever there was one. Suspiria is an ambitious but flawed attempt to remix the ideas and atmosphere of Dario Argento’s original, lacking a style that’s as interesting and colourful as before, but has a decent slow build and some out-there visuals that will either make or break it for a lot of people.